For me to be able to complete my scrapping in an efficient manner I need to have 3 components - digital kits, photographs & memorabilia and then organizing the completed layouts for printing. One of the biggest hurdles I had when I first started digital scrapbooking is learning how to organize my digital files. Each digi store has different naming conventions plus there is are so many freebies available - how do you know where everything is and how to find them later. One thing that was clear to me from the beginning - I am a "kit" scrapper - I was even this way as a paper scrapper. I like things to match so a kit with elements, papers and alphas will be my first stop for every page. The bigger monthly subscriptions, like Just Jaimee's Storyteller Storyteller Subscription and now The Lilypad's Memory Pocket Monthly subscription make my heart leap with joy!! Everything in one place that matches. It is my inner architect taking over - and genetic so I won't fight it! Even the store collab kits or blog hops like the Digi Scrap Parade are a great start for me - plus many are free or free with purchase. So I shared a little about how I link my kits for a theme in one folder (travel) in the blog before, but going back a few steps -how do I organize my kits once I've seen the new one of my dreams…which may happen once or twice a week (or more if I'm being honest..)! I purchase the kit and download right away so that I am not distracted by my busy life and forget. I might be on either my laptop or desktop - so how do I keep track of them? 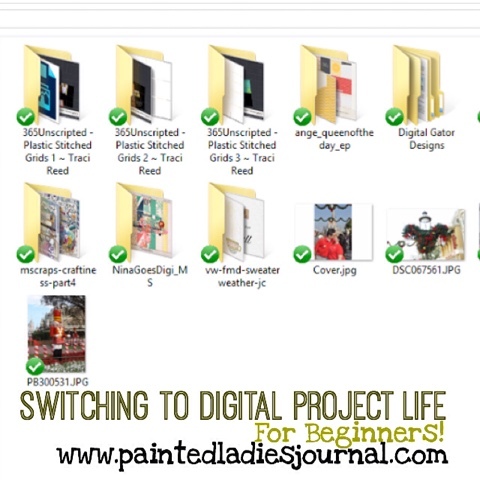 I have a "Digi Transfer" folder in Dropbox that I have set up so that I can move my files to my Desktop computer as that is where my backup is scheduled weekly for my digi supplies. My photos are similar - I have weekly folders set up in a 2015 folder in Dropbox. As I take photos I download all photos, news articles, scanned or photographed memorabilia and movie posters (for ones that I have viewed) into that weekly folder. I move photos from my iPhone through Dropbox's automatic camera download or from my "big camera" into the same folder. Since it's on Dropbox it doesn't matter what computer I've used. As my weekly spreads are completed I move the entire folder to my desktop in that 2015 folder in Pictures subfolder. That is backed up via Carbonite (real time) and on an external hard drive (daily). Finally and not insignificant is how I save my in progress and completed layouts. I also have a specific folder in Dropbox where I save my in progress digi pages. I call it "To Print" for in Progress and "Completed Layouts 2015". Last year's layouts are in "Completed Layouts 2014". I do save the fully layered PSD, a full size JPEG (flattened) and a reduced sized JPEG at 72 dpi and 600x600 pixels resolution. I hope this helps explain my process - I have completed over 300 pages since January of 2014 so there are lot of pages to keep track of! As soon as I'm done with a digi layout - I upload right away to Persnickety or Shutterfly depending on whether or not i am printing individual pages or a photo book. I do this so that I know that they are safely stored in a remote location that i can access at anytime!!! Drop me a line if there is something I can help you understand better!